Well, I feel very lucky to live in my area! I live in Southern Ontario, right at the base of the Niagara escarpment, very close to the Bruce trail, in a city called Burlington. 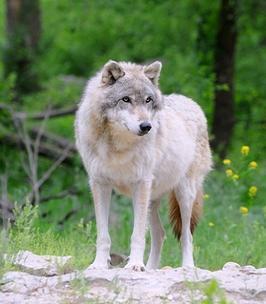 I used to see the Wolves more often about 5 years ago, and I have not seen any since then. When I did see them, they were alone, so i would see one at a time. Sometimes I would see them on the Soccer fields behind my house, and we would see Deer and other smaller animals too. It was strange actually to see them because there are a lot of homes in the area, and I know they are very shy of humans. I always wondered if they maybe had become lost and ended up in the wrong neck of the woods! They were a rare treat to see, but I did see them multiple times over a period of about 10 years, unfortunately, I have never observed a pack of Wolves in the area, only lone Wolves. They would often just be walking across the large field behind my house. I was driving to work around 6:20 am on Thorold Townline Road in Thorold, Ontario, when a beautiful grey and white Wolf (or what appeared to be a Wolf) was walking in the ditch on the side of the road. We have tons of Coyotes near my home and to me this beautiful creature did not look like one. Hi all, On December 16th around 11:30 pm , I saw three huge grey wolves at Guelph line-south service road, Burlington, Ontario. One of them has a missing leg, but they ran very fast in the heavy snow of that night. It was the first time that I saw wolves in the city. They were not frightened by me, I started the car and turned on the headlight, to follow them. I was on a back road right beside Appleby and I pulled over to have a cigarette and as I got out of my car and spend 10 seconds outside I noticed something move about 15 feet from me I saw the biggest scariest all black wolf/dog/coyote looking at me. So we exchanged looks and I made a sudden leap towards it to distract it so to buy time to jump in the car. It ran a few feet, I got in the car and as I started driving, it jumped in front of my vehicle and started running about 30 km per hour and within about 100 feet it went into the field and watched me drive by. I have never seen such a big all-black Coyote! This thing was over 100 pounds that's for sure, and usually Coyotes in the area are half that size. We just moved to a property west of Scotland, Ontario . I spend a lot of time in the bush cutting firewood in the winter. A few days ago I came across some new prints in our bush, big prints full claws and heavy. I grew up in the bush up north and have only seen these prints once before (Timber Wolf). Is this possible this far south? Taking my camera with me from now on, would love to get a picture of it and the very large buck that evaded the bambie killers this fall. I back on to Kerncliff Park and spend quite a bit of time back there with the family and our dog. We hear Coyotes howling at night all the time and have seen them from time to time (mostly on the golf course). I ran into a lady a couple of months ago (we both had our dogs out for a run) and she told me without a doubt that she has seen Wolves and Coyotes in the area. When I asked her to clarify that she has seems "Wolves", she said absolutely and based on our conversation I think she knows what she is talking about (she spoke of the size and colour difference). It's largely rural west (and north) of North Burlington so I don't think it's a stretch to think that there are Wolves in the general area. Let's face it, if a Black Bear can wander south and into Mountainside (Brant and Mount Forest) then why couldn't a Wolf............or Wolves! We back on to the 407 in Burlington & this morning we spotted what I am sure were two wolves walking on top of the berm behind our house. We have seen coyotes before and these two were much bigger & bushier than coyotes. They walked along the berm, one behind the other until they were out of our site. We were surprised to see them as we had thought that there were no wolves in the area. While walking on the Bruce trail on Sunday February 13th 2011, along the upper escarpment above Walkers Line, we came across fresh tracks in the snow. They were too large for a Coyote. We kept walking and suddenly my girlfriend spotted him just below us he was very large he was off in a second we watched him into the distance. We continued to walk and found the spot he went down the escarpment, and at that point we realized he was just in front of us the whole time we were following his trail. It was an amazing experience. I've seen Coyotes up close and personal, and this was no Coyote it was too majestic. Hi again! I thanked you before for sharing your experience (I'm the one who's writing a story). I e-mailed someone at the Bruce Trail Conservancy to ask if Wolves live in or around the Bruce Trail. The reply was that she had never heard of Wolves in that area, but that she has heard of Coyotes living in that area. Perhaps what you saw was in fact a Coyote? I'm so glad to hear that someone else sighted such a majestic animal. I'm sure I saw male and female wolves in Beamsville. I hope that is what it was - the male was bold and sitting like a dog and the female was hiding in the dead long grass. I have also observed Beavers in Grimsby, Ontario, (I won't say where as some people .... you know!) and I have also destroyed over 100 Muskrat traps and have observed the beauty of Bald Eagles on the Grand River. I sure hope others have these wonderful experiences! b) in or around the Bruce Trail. Who knew I'd find the answers to both questions on the same webpage? I certainly didn't think I'd find anything about a wolf sighting in Burlington specifically! Thanks a lot, I hope that was a magical experience for you, and that you might see one again sometime. Who would think that there would be Wolves so close to cities - Burlington isn't where I would think they would live, but I guess as long as there is food for them, and places to hide, they will be there.